BAKERSFIELD, Calif. — It was a shocking lesson plan students didn't expect and a hands on work experience they'll likely remember. High School students from around the county took part in an emergency drill with the Kern County Health Department Wednesday. 23ABC News spent the day shadowing the high school students as they transformed into health department officials for a day. For many of the high school students in the youth leadership group Wednesday started off like any other day. 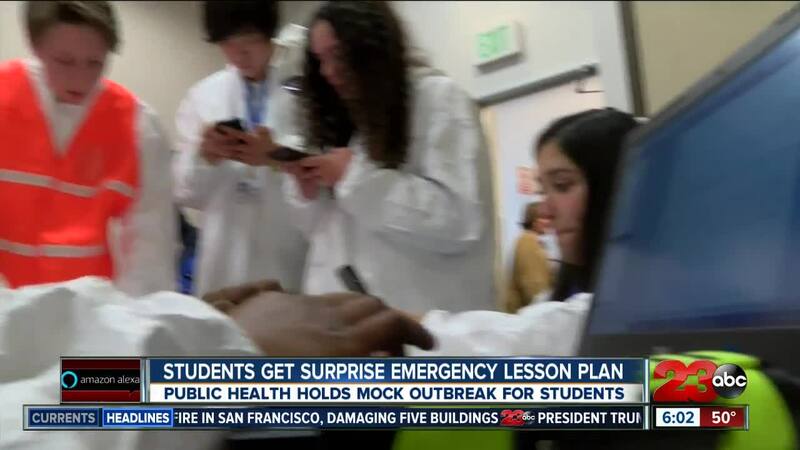 However, upon arriving at Kern County Public Health Department students quickly realized there was a different lesson plan in store for them. Kern County Public Health officials began rushing students off the bus into the health department. Students began breaking up into teams of six and suiting up into protective gear to properly address the mock disease outbreak taking place in Kern County. Students began interviewing patients who were volunteers for the exercise to identify symptoms,"He has shortness of breath, he's nauseous, he has lesions and sores and he's fatigued and he has chills, weakness," one student said while examining the patient. After asking about symptoms one patient out of several told strike team number one he ate at a Jack in The Box and he believes it made him sick. Shortly after gathering info students moved onto the next faze of their investigation into the outbreak, "We're going to take all of the location information you guys collected and paint a picture of it on the map, the second way we are going to find the source of the outbreak is through epidemiology,"A Kern County Public Health Official said. "It's an excellent opportunity for our up and coming leaders that are going to take over our jobs and make this community even better, to be exposed to some of the event and some of the issues we face on a daily basis,"Director of Kern County Public Health Matt Constantine said. Students eventually went out to the parking lot of the health department to examine the, "field" for the source of the mock outbreak. Students learned how to collect samples from cites in question and how to spot instances where health code compliance was not being followed. Groups then dropped off samples at the lab collected from different hot spots in the field. One member from each group acted as the public information officer to address the media with the source of the outbreak and details from their investigation. Many students impressed the audience with their speeches, "We found out that each patient had the E. coli strand which signifies that they all were affected by the same thing," one student said in his speech from the podium. However, for many it was their first time answering questions in front of a full room with lights and cameras rolling and of course drilling questions from the media. "Is there a possibility that there could be other lettuce that could be contaminated in our area that could impact our community?" 23ABC News reporter Tori Cooper said. "At this time any part of lettuce that you see stay away from it hahah," another student at the podium said in response to reporters. Some students also showed signs of a bright future in the business, "Right now we don't have any further information to take action as to close them down so if we do we will alert it to the public," One student said from the podium. Of course there wasn't a real E. coli outbreak in Kern County. However, if there was students proved they would handle the situation professionally. The event will take place again next year but the health department will likely have a new and improved challenge for students.